Wow everyone! Thank you so much for all the positive, kind and encouraging comments you left on my last post. The Farmer and I read through them all - I cannot thank you enough for your enthusiasm. It is so great that so many of you who read faithfully do not have me pigeonholed into the knitter only world. I think one of the frustrating things for me - which I touched on the other day - is that publishers and corporations - only see me as having one skill or talent. It will take a long time to beat that and I do not know if I ever will. I am just going to carry on doing what I want art and design wise as long as I can afford to do that. And I mean afford that financially. Creatively is not a problem but financially may be. (Anyone want to come to a class at the farm?) I've got some plans for future products and I have some very positive things in the works that should help me with that. I will be selling things via the internet because I am not interested in getting into the wholesale world. In the fall, when most of the retail dollars are spent, I will probably do some "house shows" if I can find friendly, drivable locations with a demographic that has money and likes to spend it on handmade things. I'll talk more about that later this summer. Where we live is the least affluent counties in Massachusetts. I do not expect to be able to peddle my pots here because folks just don't have the income to purchase them. And now - generated by Random Number Generator - the winner of the Happy House..... The winner is Annie and I have contacted her via her email address. 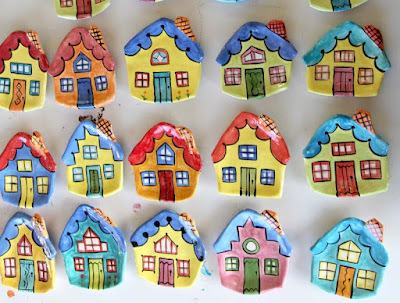 I wish I had enough time to make you all a Happy House. Seriously I do. Thank you to Taproot Magazine for featuring my "Fabric Hanging Lanterns" in their newest issue called Wild. Do you know Taproot? 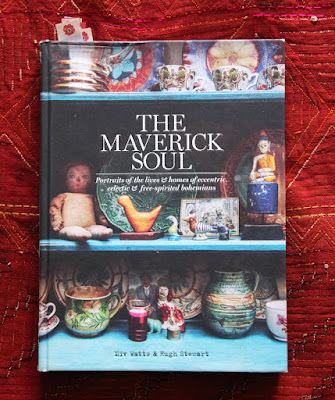 It is a small independent magazine edited by Amanda Blake Soule, author of many books and of the blog Soulemama. I have subscribed for quite a while. It has an interesting, non-mainstream vibe to it which I enjoy. There are essays, recipes, projects, and art. No advertising either. 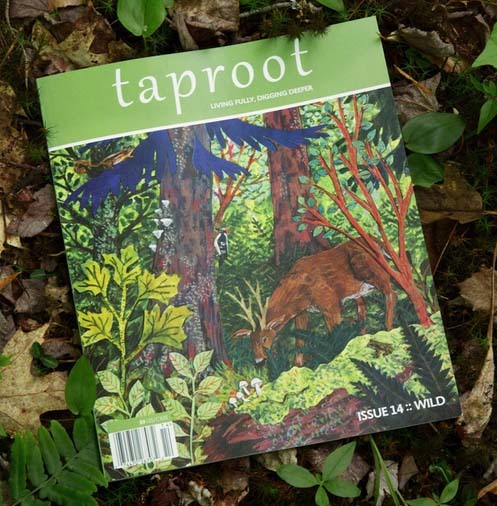 What a nice mix and so happy to have been included on the pages with all the other talented folks who write, do art, and photograph for Taproot. In this issue, I especially enjoyed the article about gathering things to eat from the wild, including sumac berries. I have that on my list to do this fall. Isn't this illustrated cover beautiful? It is by artist Phoebe Wahl. An aside, today I saw a mother doe with her just born fawn. I didn't have my camera with me. Darn. I watched the British film Mr. Turner the other day. It is about Britain's most famous landscape painter JMW Turner. There was one scene that was amazing - the salon at the Royal Academy where all the member painters showed their work. Astounding. No photos to sell off of - buyers had to come to see the work. I found a video that explained it here. I have embedded it below. Worth a watch - the whole movie is. Makes one think - especially about fame in the world before social media and aging. I want to watch it again because I was sewing and missed some visuals. Just so you know - Mr. Turner isn't a very upbeat movie but it is beautifully filmed, written and acted. But it made me think a lot. That's it for today - again - thank you everyone!!!!! Farmer's Market tomorrow in Northampton. It is supposed to rain and thunder. UGH. No fun. But sometimes the weatherperson is wrong. How ridiculous to see you, or anyone else, as talented in only one area. 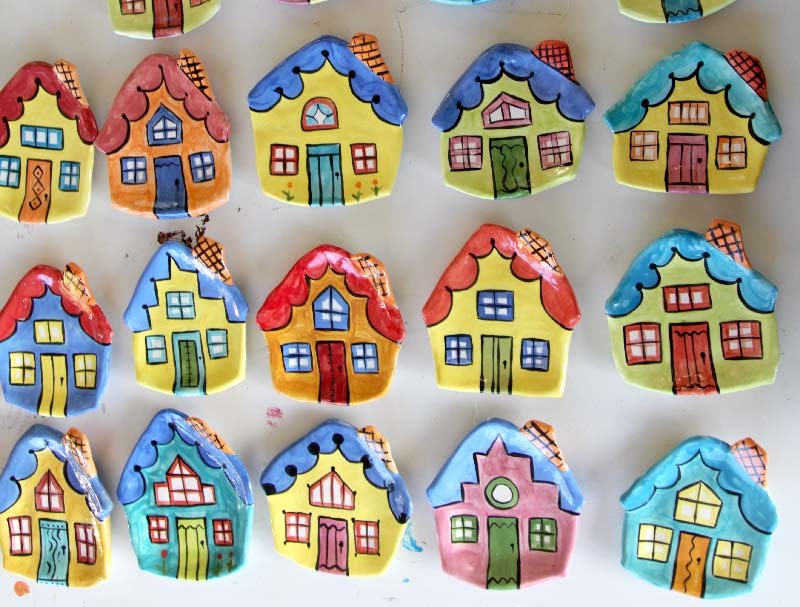 Many creative people participate in many different crafts. 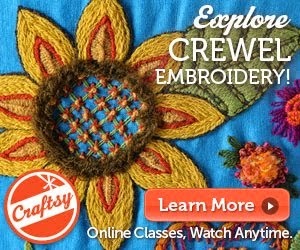 I knit, crochet, weave, sew, quilt, paint, draw, and make jewelry. You are so talented in many ways, maybe the publishers will realize that, I sure hope so. It can get boring to keep working on the same thing, in your case knitting, especially if you have to make multiple of the same thing or keep teaching the same class. It is natural to branch out, but hard when you're trying to make a living out with your art. I love the pottery, although I didn't quite understand the dimensions of the bowls. Good luck with this endeaver. Enjoy. I appreciate your continuing to post on the blog. If we're BOTH "LUCKY", the weather won't get messy until the evening..?! -- I've got BIG dental appointment waaay across town in the afternoon... And, I wanted to do some "shopping" afterward. But, IF it gets stormy -- I guess I *won't* be blowing my "budget" on yarny-stuff! Kristin, continued best wishes to you on all your endeavors. I saw the exhibit Late Turner at the Tate when I was in London last fall, and even though I've been to the Tate many times and thought I knew just about all of the museum's huge Turner collection well, it was still an interesting exhibit, although seemed to have a lot of "filler" works that were not truly late Turner. Still, having that refresher did add to my appreciation of the Mike Leigh film Mr Turner that I did manage to see at the cinema. Timothy Spall is a longtime favorite actor of mine, and I thought his performance as an immensely talented, driven artist who was not a very nice man, was remarkable. I definitely recommend the movie to anyone who's ever painted. I am over the moon to win the Happy House! Honestly, I love just about everything you make :) I like color, and I'm not confident enough in my own combinations; I look to your work for inspiration often. And your photography!